Good quality dentures make a huge difference to your quality of life. You do not have to accept loose, bulky plastic dentures or unsightly metal clips – we can provide you with exceptional dentures that are suited to your exact requirements. We use the very latest ultra-thin materials which have a self-gripping effect. We use the latest technology and draw on our vast experience with dentures to ensure you are completely happy with the result. The correct type of denture depends on your requirements of strength, comfort, grip or appearance. By having a thorough examination of your mouth the right denture can be designed for you. Dr. Mark Setters BDS has over 20 years’ experience and has made over 1,000 cosmetic dentures in that time, which patients have been very happy with. He has always been interested in treating both simple and difficult denture cases, full or partial, especially where other dentists have not been successful. We also welcome emergency denture appointments, so don’t hesitate to get in contact if you require any kind of denture work in Horsham, West Sussex. There are many different materials and designs that can be used in making dentures. For example, flexible or acrylic dentures can be used according to the needs of the patient. We have the expertise to guide you through these choices. We are happy to go through all the details with you so that you can feel comfortable that the decision you are making will lead to having the right dentures. We only use the highest quality technicians in the UK. We are not “tied” to a lab which means we pick and choose the best technicians for the different types of denture. “For the first time in years I can eat and chew whatever I want” – Patient Testimonial. Read more testimonials. Dentures take from 1 to 8 weeks to make depending on the design and material. The appearance of your denture teeth is of paramount importance to you, and so it is to us. We will give you the full choice of tooth shapes and shades to ensure you are able to personalise the appearance of the denture to suit you. You will have the final decision on the appearance of the dentures before they are completed. 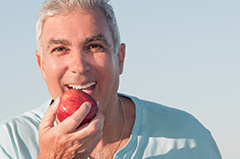 Choosing dentures that are right for you is easier with us. Call us today to make an appointment.